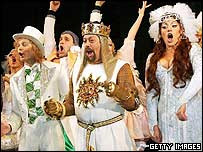 The stars of Monty Python's Flying Circus have attended the UK premiere of their hit musical, Spamalot. The show, based on the Pythons' 1975 Holy Grail film, has transferred to London after a Broadway debut last year which won three Tony awards. "I just hope it's going to be OK," said Terry Jones, who directed the original film. "My mortgage depends on it." Other stars attending the gala opening included Eddie Izzard, Sir Cliff Richard, Cilla Black and Stephen Fry. John Cleese was the only surviving member of the Python comedy troupe not present at last night's event, due to filming commitments in Australia. The musical, which is loosely based on the legend of King Arthur, features flatulent Frenchmen, a legless knight and a killer rabbit. Despite its success on Broadway, where it took $1m (£534,000) in a week, writer Eric Idle admitted to being "a little nervous" at the London opening. Terry Jones added: "It is a very emotional moment. I hope I will be able to survive the emotional shock of it all." 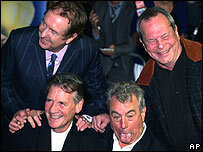 But fellow Python Michael Palin said the event gave the comedy stars a rare opportunity to catch up. "It's one of the few times when we can actually talk to each other, make a few jokes, and count up the money," he said. British actor Tim Curry reprises his Broadway role of King Arthur in the show, marking his first West End appearance in more than 20 years. Best known for film roles such as Dr Frank N Furter in The Rocky Horror Picture Show and Legend, Curry's London stage credits include Hair and National Theatre work such as The Rivals. Shakespearean actor Simon Russell Beale will take over the role in London next January.